Young William Svensson with the 7.5kg coral trout he caught off Bundaberg. He needed help from his Grandad David Svensson to land it. Dale Smith with the 50cm mangrove jack he caught in the Burnett River last weekend. 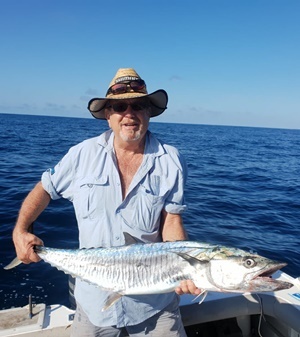 Les Rayner with the Spanish mackerel he caught last weekend using a Laser Pro lure. It was his first catch using lures. Once again the weather forecast for the Bundaberg area for this weekend is looking fantastic. We all can’t remember such a good run of weather around the local area in ages. Most of the boats took advantage of the flat conditions last weekend and fished around the islands off Bundaberg and 1770. By all reports most boats managed to capture the bag limit of reef species including coral trout, sweetlip, nannygai, parrot and hussar. Let’s hope the fishing is as good offshore this weekend. With the good weather, heaps of smaller boats had a ball fishing all the inshore reefs along our magical coastline. Areas such as the Two Mile, Ryan’s and the Cochrane Artificial Reef all produced a mixed bag of grunter, sweetlip and some small mouth nannygai. Also, there were massive schools of tuna, school and Spanish mackerel on all the popular marks during the past week. One of the easier ways to target these speedsters is by trolling large hard body lures such as the Halco Laser Pro. These are awesome lures that troll really well at high speed. My son and I had a quick fish on the Burnett last Sunday morning. We could not believe the amount of quality bream on most of the rock walls in this awesome river. Two of the soft plastics that worked extremely well fishing the rock walls were the Squidgy Prawns and the Zman 2.5” Grubz rigged on lightly weighted TT jig heads. 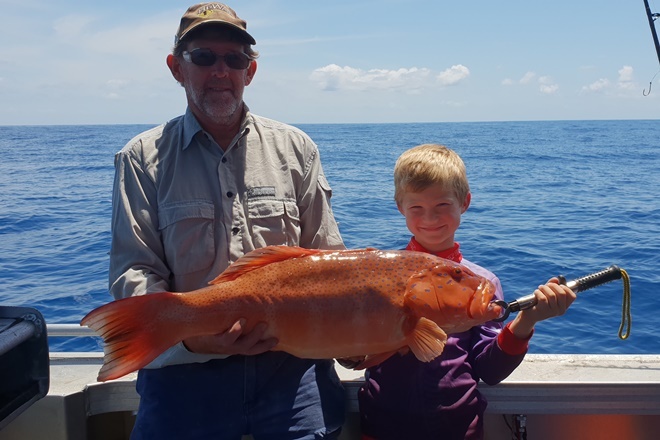 The Across the Waves Fishing Club had an outing on the Burnett last Sunday also, and the quality and size of the fish weighed in was impressive. If things continue like this it’s set up to be an awesome bream season around the Bundaberg area. Both the Baffle and Kolan systems have continued to fish well this week and with the bigger tides this weekend due to the full moon on Thursday, the fish and crabs should be on the job. Both of these and most of the river systems around Bundaberg are holding a fair population of good sized river prawns and with a bit of effort cast-netting, most people are getting a good feed. Now is a prime time to target the barramundi at Lake Monduran. It’s fantastic to see this world-class fishery that is so close to Bundaberg doing so well. 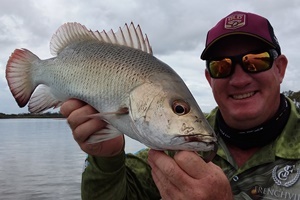 The average barra caught has been between 60cm and 80cm and the red-hot lures have been the Lucky Craft Pointers and Jackall Squirrels. Let’s hope the good weather continues so we can all spend more time out there on the water.